The U.S. government at the federal, state, and local levels has to get its money from somewhere. So it taxes individuals, businesses, and corporations to get the money it wants for its countless programs. Today we will show you through a series of skits how this is done. The Notgrass Company has sponsored these fun blog posts because we are basing this series on their Exploring Government book. One of the chapters requires students to understand the ways that citizens are taxed. 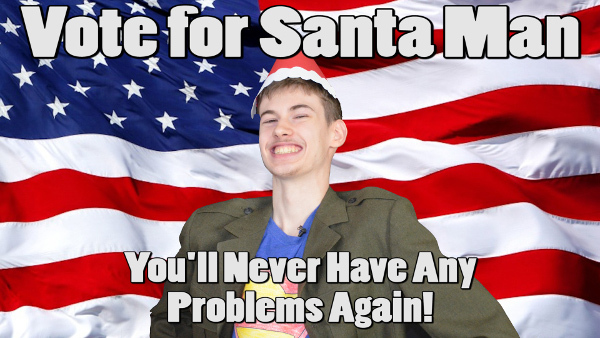 We continue our series of high school government with another set of skits for your enjoyment. The income tax is the main source of federal revenue, providing over half of federal money. This is a progressive tax, which means higher incomes are taxed more. The next biggest source of revenue for the federal government is the payroll tax, which provides about one-third of federal money. This tax helps pay for Social Security and Medicare. Other taxes include an excise tax of things like tobacco, alcohol, jewelry, and guns, customs of tariff duties on some imported goods, estate taxes when an heir’s inheritance exceeds $2 million, and much more. States also have an income tax. Some states don’t tax personal income, and so have to rely more on other taxes. Usually, income tax rates are form 2 to 6 percent. Another major state tax is the sales tax. Most states impose a flat statewide rate and let counties and cities add an additional tax on sales within their borders. States also get a lot of revenue from automobile-related taxes. In about half of the states, there is an Ad valorem (to the value) tax for registering a vehicle. There are also taxes of alcohol, tobacco, utilities, theme parks, and hotels/motels. Cities and counties impose property tax on the assessed value of the real property in them. Homeowners and business owners both pay property tax. There is also a business tax, which is a small percentage of the total sales a business has in a year. Counties also charge for a business license. 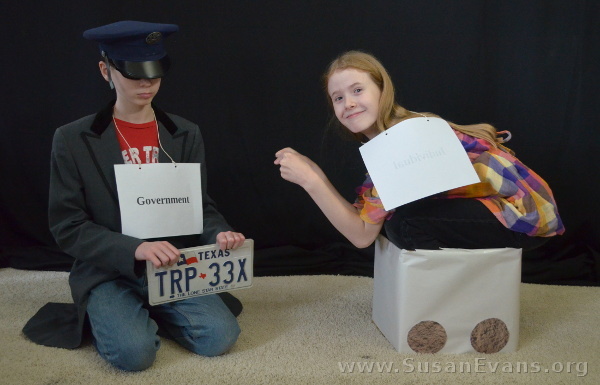 I hope you enjoyed our re-enactment of “How Government Gets Its Money.” We made quite a few props for these skits, and we had a blast behind the scenes! 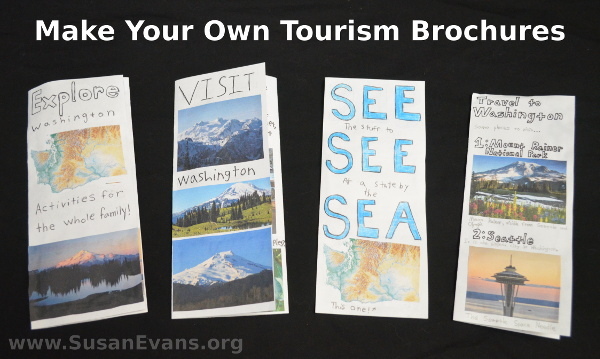 We truly enjoyed producing this series of high school government posts, breaking down concepts from the Exploring Government book, and making them come to life! If you would like to buy the book, get it from the Notgrass website to bless their family the most! 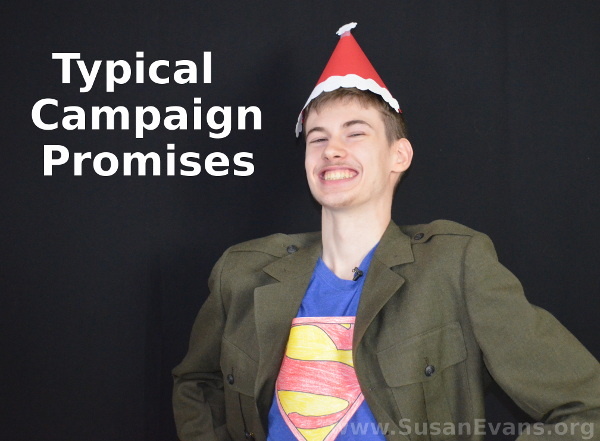 This time my kids did a video called “Typical Campaign Promises.” They noticed on the news during a presidential election that presidents typically will promise lots of changes that don’t end up happening when they actually get into office. My 16-year-old son wrote the script for this funny video, another son directed and filmed the video, and my third son edited the video! The Notgrass Company has sponsored our series of government blog posts because we are using Exploring Government for our study of high school government.This is the ninth post in this series. 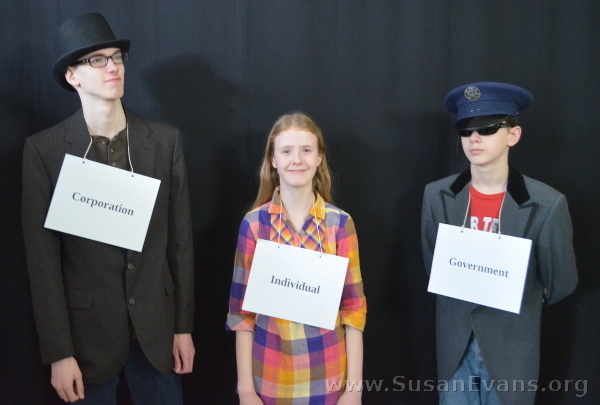 We are very much enjoying dramatizing these concepts to help bring them to life for high school students worldwide! 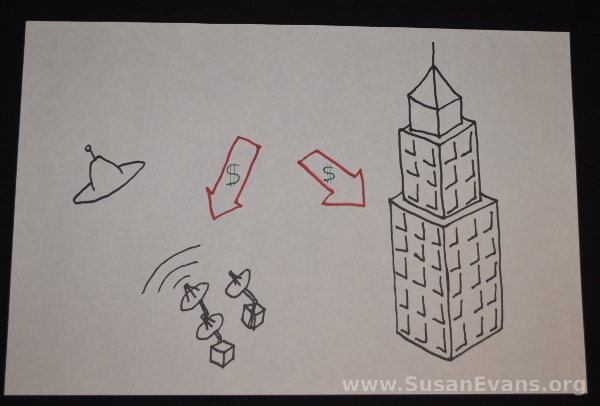 My kids drew a set of posters to illustrate the points that the presidential candidate was trying to make. According to the Exploring Government book, the best way to run for public office is to start small by running for a seat in the city council or county commission. You need to get to know as many people as possible, especially people already in local government who could endorse you. You fill out the proper paperwork with the local election commission. Then you have to get the signatures of a small number of voters on a petition and pay a fee to have your name on the ballot. Ah, yes. Begin small and work your way up to the presidency by being a person of integrity and actually fulfilling your word. 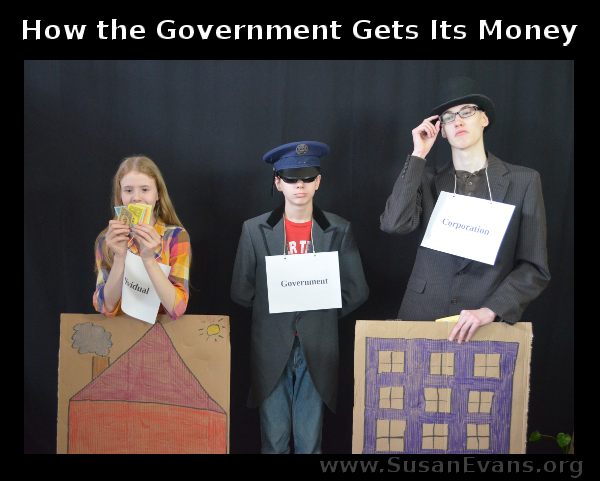 Stay tuned for the final installment in our high school government series: How Government Gets Its Money! The Notgrass Company has decided to expand this government series by sponsoring these blog posts! You guys, as homeschoolers, you have to teach government to your high schoolers anyway, and the Exploring Government book is clear in its explanations, full of modern color pictures, and interesting in its examples (as you’ll see in the mafia counterfeiting illustration below). It makes the study of government actually enjoyable. 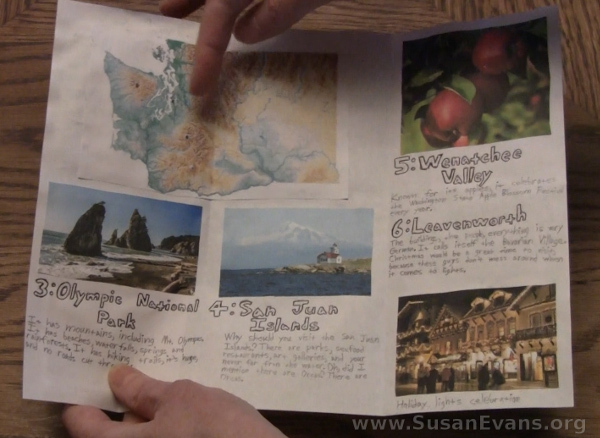 It’s perfect for Christian homeschoolers. Go buy it already! A Chicago gangster is counterfeiting money in his basement. Two federal agents break into his house and tell him he in under arrest. They tell him he has the right to remain silent, that anything he says can and would be used against him, that he has the right to have an attorney present at any interrogation. If he can’t afford a lawyer, one will be provided for him. The gangster (we will call him Bob McBob) is taken to the county jail, then to a federal magistrate two days later, along with his gang’s leader (Fred Fredrickson), who was also arrested. They both plead not guilty to the charge of counterfeiting. The magistrate set the bond the men had to pay in order to be released from jail until the trial. This money is a promise that they would not run away before the trial. If they did, the state could take their assets. The magistrate set the bond at $500,000 each, which they couldn’t possibly pay. So they had to stay in jail until the trial. The prosecutor offered McBob a plea bargain. If he would plead guilty, the government would ask for a lesser sentence in exchange for his testimony against Fredrickson. The federal district judge held pre-trial hearings where he heard defense motions regarding the trial. The defense attorneys asked for a change of venue for the trial to try and get an impartial jury. They also questioned the specificity of the search warrants and asked that the evidence the agents gathered be suppressed. But the judge refused all of these and set a date for the trial. Before the trial the two sides exchanged witness lists, the prosecuting attorney gathered evidence, and McBob’s defense attorney met with him and discussed the plea bargain. McBob ended up agreeing to the plea bargain. When the time came, McBob and Fredrickson appeared before the federal district court on charges of counterfeiting. The judge heard the opening statements and the prosecuting attorney called in witnesses. After hearing the witnesses’ and McBob’s testimonies, the jury pronounced them both guilty. The judge sentenced McBob to four years and Fredrickson to ten years in prison. 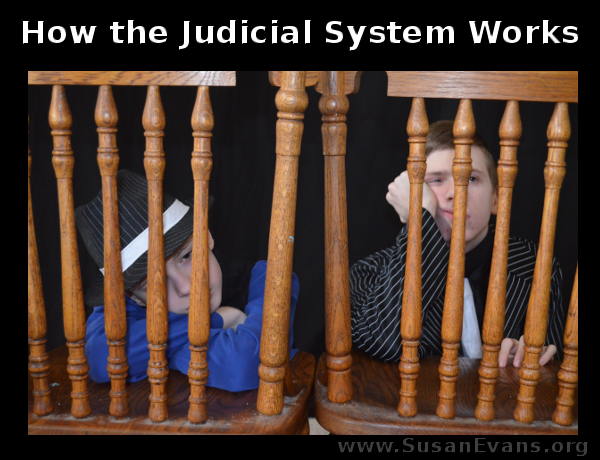 I hope you enjoyed our re-enactment of “How the Judicial System Works.” Stay tuned for the next episode: The Bill of Rights!